(update) additional recordings, Lucille Ball stars with Richard Denning in this pre-I Love Lucy radio comedy. They are Liz and George Cooper, "two people who live together and like it." 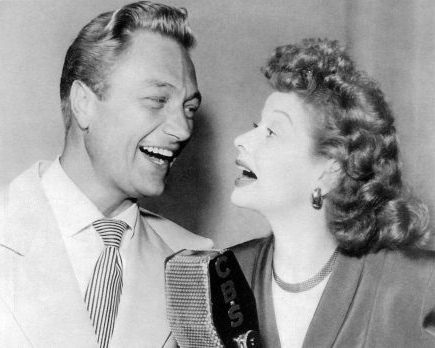 Lucille stars with Richard Denning in this pre-I Love Lucy radio comedy. They are Liz and George Cooper, "two people who live together and like it," based on the popular novel "Mr. and Mrs. Cugat," by Isabel Scott Rorick. The couple lived at 321 Bundy Drive in the pretend city of Sheridan Falls. 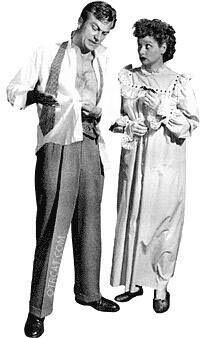 Lucille Ball plays Liz as the oddball wife and Richard Denning plays George is the typical straight-laced husband. Also featured in this show is Gale Gordon, the "slow burn" specialist, who plays the overbearing boss, Mr. Atterbury. He is well known to fans of old time radio as principal Conklin on Our Miss Brooks, a show that served as one of the models for this one. Part of the appeal of the show is to hear Lucy, the magnificent comedy talent doing another show besides "I Love Lucy." We can study Lucy's timing and inflection delivering wacky lines prior to working with Desi Arnaz. Desi was lucky to be the big lug that this nutty lady attached herself to, a Cuban conga player singing Babaloo got to the "favorite husband" after all. For more Lucille Ball recordings, see the Lucille Ball Collection. Easy Aces and My Friend Irma were other shows that featured the ditzy wife. The queen of ditzy wife role was perfected by the Gracie Allen, of Burns and Allen. This collection included in the larger Lucille Ball and Richard Denning Collections. See also: It's Higgins Sir. Be the first to comment on "My Favorite Husband"